Dr Carolina Escobar obtained a bachelor degree in Psychology by the Universidad Nacional Autónoma de México (UNAM) , the Masters degree and PhD in Physiological Sciences also by UNAM. 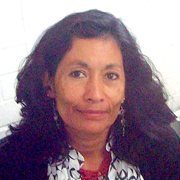 Carolina Escobar is now full time Senior Professor at the Anatomy Department in the Faculty of Medicine UNAM and directs a laboratory for basic research on Circadian Rhythms, Food intake and Metabolism. At the present time she coordinates the Research Programs of the Department and participates in several committees for evaluation of research projects in the University. She is member of the National Research System in Mexico, of the National Academy of Medicine and the Mexican Academy of Sciences. Also, she was vicepresident and president of the Physiology Society in Mexico (2008- 2011). The main contributions of her laboratory have been on the behavioral, metabolic and brain mechanisms of food entrainment and on the deleterious effects due to circadian disruption. Therefore, a main task in her laboratory has been to develop experimental models that mimic human conditions of night feeding, night work, jet-lag and sleep disruption. Her work is based on rodent models and contributes to basic science. Her research on circadian disruption has provided evidence of the relevance of timing food intake and activity to keep the organism’s integrity. Consequently it has been evidenced that food and activity during the rest phase have a negative influence on behavior and health. This has provided a new perspective of the circadian system as a key process for homeostasis. Also, her group has described mechanisms of circadian entrainment by regular and palatable food, which now can partly explain the process of addictive behavior. Organisms living on Earth are exposed to geographical cycles which require rhythmic adjustments in behavior and physiology in order to anticipate these cyclic changes. In this talk temporal cycles and their impact on individuals will be discussed, as well as the mechanisms that allow temporal adaptation. Next, the relevance of a correct synchrony between the biological timing and the external cycles will be discussed as a factor for health and wellbeing. Finally experimental models for temporal disruption will be presented and the results obtained with such models indicating the loss of homeostasis and of behavioral adaptation.